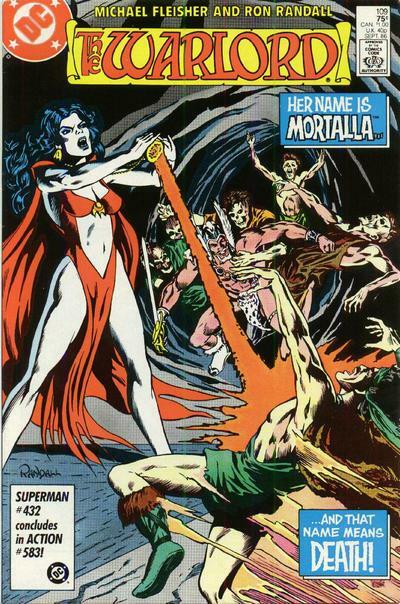 After awakening the vampiress Mortalla, Morgan and Shakira must now face off against not only her, but the zombies she commands and their former comrade and Shakira’s former lover, Daimon. Ron Randall and Michael Fleisher continue to chronicle the latest threat to Morgan’s mission and the fate of a onetime ally in this chapter of The Warlord. There is a ton of action to be had from cover to cover and the pace hardly slows down for a second. Mortalla may be unlike a foe Morgan or any of his allies have faced before, but he is undaunted against threats that may be more than he can handle. Travis is a brave man, a foolhardy one for sure, but nobody can question his courage and when you add to that the fate of his daughter whose life currently hangs in the balance, he has an even greater reason to defeat this foe sooner rather than later. There is a brief flash of what Machiste and Mariah are up to and it continues to cement a small plotline that started with their story, namely Mariah’s feelings for Morgan and how they might be more than just that of a friend. Why, at this point in time Fleisher has decided to play around with that particular sub-plot is strange, especially as there is already enough tension between Tara and Shakira. As a reader, we know that Morgan loves the ladies and more often than not, the ladies love him, but this story was put to bed a long time ago and it just seems silly to dig it out now after all this time. Another interesting thing about this tale is how it shines a light on Shakira. It may not reveal anything too deep or define her origins, but it at least gives us a little bit which is better than nothing, especially on a character who has been a mystery for a very long time. This was a very good, action-packed episode in the life of our hero by a creative team that just keeps getting better, though wrapping this storyline up at some point would not be the worst thing to happen so that Morgan can move onto bigger and better things.